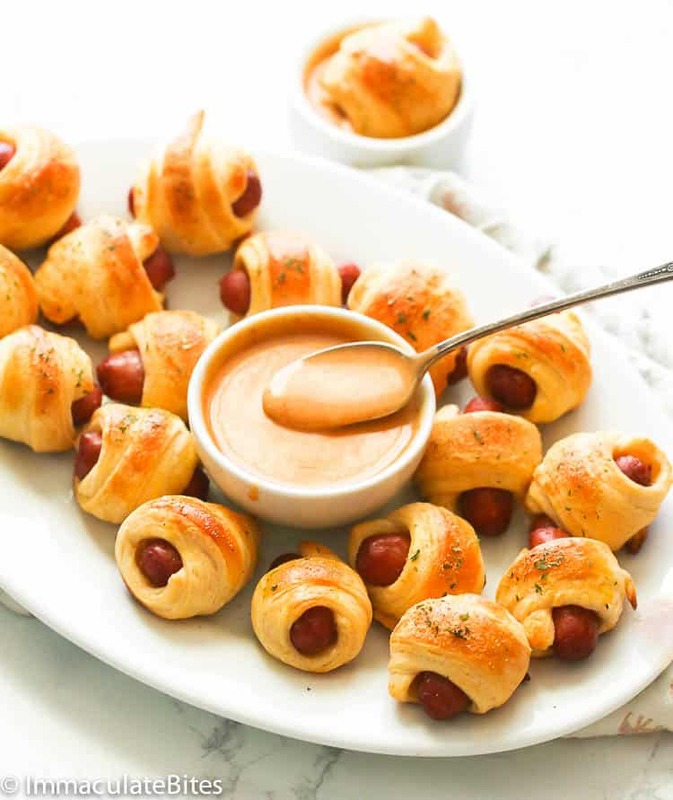 Pigs in a Blanket – crowd-pleasing bite-sized treats made of sausage rolls rolled in a crescent roll dough and baked to perfection. Makes a fun-tastic party appetizer or game day food. Serve it with my homemade honey mustard sauce! If you happen to be a football fan, then I bet you’re too anxious now for the upcoming Super Bowl in Georgia. Well, I’ll watching it on TV to catch the halftime performance, and, of course, for the FOOD! What do you expect? This gal here is all eyes set on the food during game days and parties. 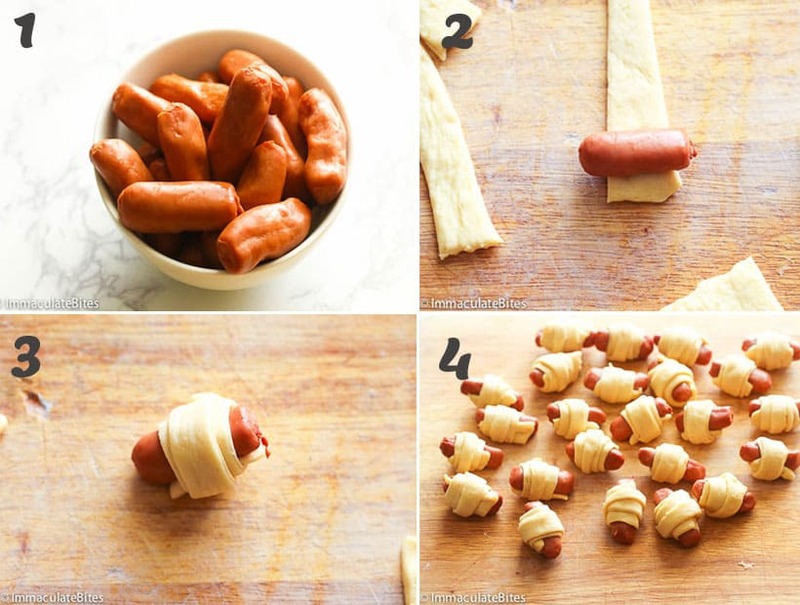 How do you make homemade pigs in a blanket? 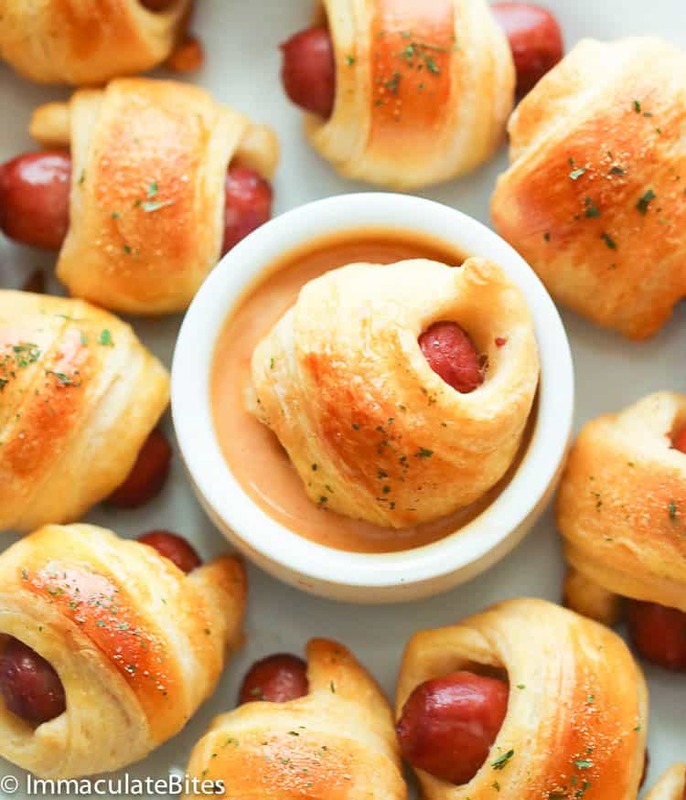 These pigs in a blanket are SUPER easy to make – easier than this Beef Sausage Rolls. It only has 4 ingredients and it’s as easy as rolling the sausage with the crescent dough and popping them in the oven. Simple! What makes this version extra special is that I sprinkled them with my homemade Creole seasoning. As a result, there’s great flavor in every bite. 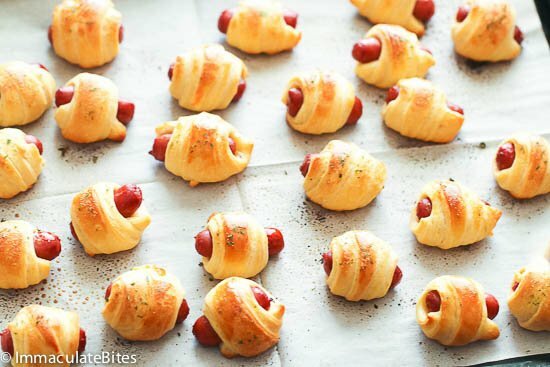 So how do you make this pigs in a blanket? 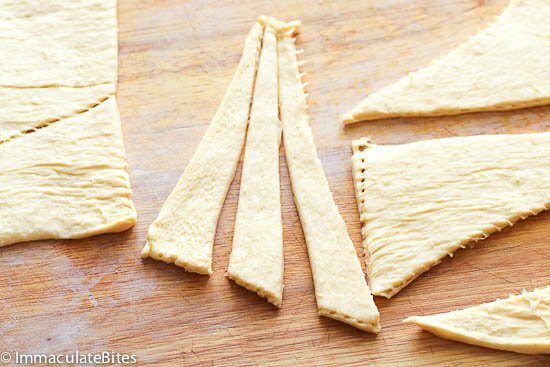 First thing you need to do is to take out your store-bought dough or puff pastry and cut them into skinny triangles in lengthwise. Then place the sausage on the wider end of the triangle and roll towards the other end of the dough to wrap securely. Place it in a baking pan with seam side down, lightly brush with egg wash and sprinkled with creole seasoning (which is optional by the way) and bake them until golden brown. If that is still too much work you (whaaat? ), you can always make these in advance and store in the freezer for up to a month. All you have to do then is thaw and bake it every time you have guests or when you get the hankering to. 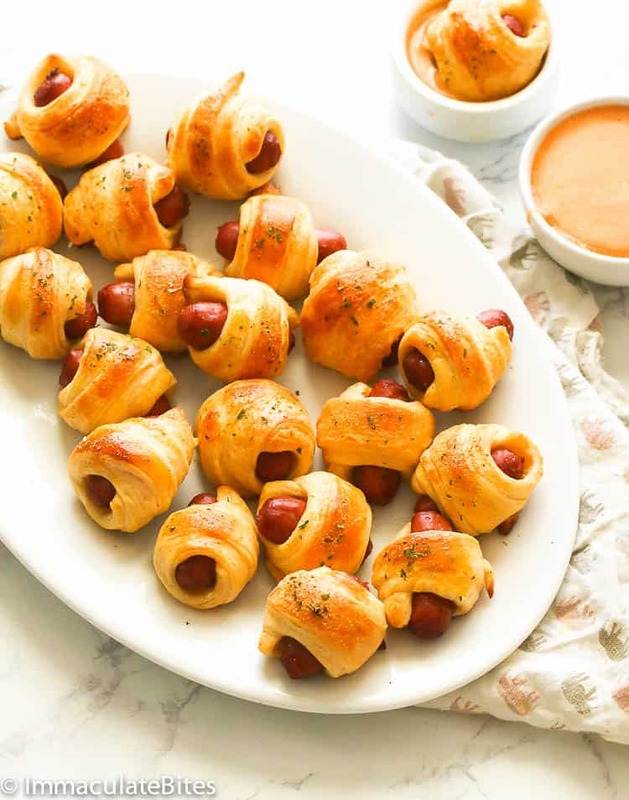 To make these pigs in a blanket in advance, place uncooked pigs in a blanket in a baking pan in a single layer and freeze. When it’s frozen, remove them and store them in ziplocs, write down dates and put it back in the freezer. This could last up to a month. Aside from that, you can also store them in the fridge if you’re planning to serve it the following day. Assemble the pigs in a blanket a day in advance, place it on a baking dish on a single layer with layers of baking paper in between layers and put in the fridge for 3 days. How do you make your own honey mustard sauce? Making sauces at home is as important as making the main course from scratch. I’ve always love homemade! With homemade sauce, you can easily adjust it according to your liking. This honey mustard sauce is definitely a must-have! It’s so simple to make with only less than 5 minutes of your time. Just simply add them in a large bowl and mix well until thoroughly combined. Let it sit first in the fridge at least an hour before serving. This honey mustard sauce here is creamy, smooth, with the right amount of sweetness hotness and a sharp complex edge that pairs well perfectly with almost anything! If you prefer a sweeter sauce, add more honey. And if you don’t have Dijon mustard, simply replace it with stone-ground mustard or the milder yellow mustard. What goes with the honey mustard sauce? You’d be surprised how versatile this honey mustard sauce is. Aside from being the go-to dipping sauce for our pigs in a blanket, you can actually drizzle this on salads as a dressing, too. This also pairs well with other scrumptious appetizers like some french fries, chicken nuggets, chicken tenders , sausage balls, meatballs OR even with baked pretzels. Steamed or roasted veggies taste great too with this honey mustard sauce. 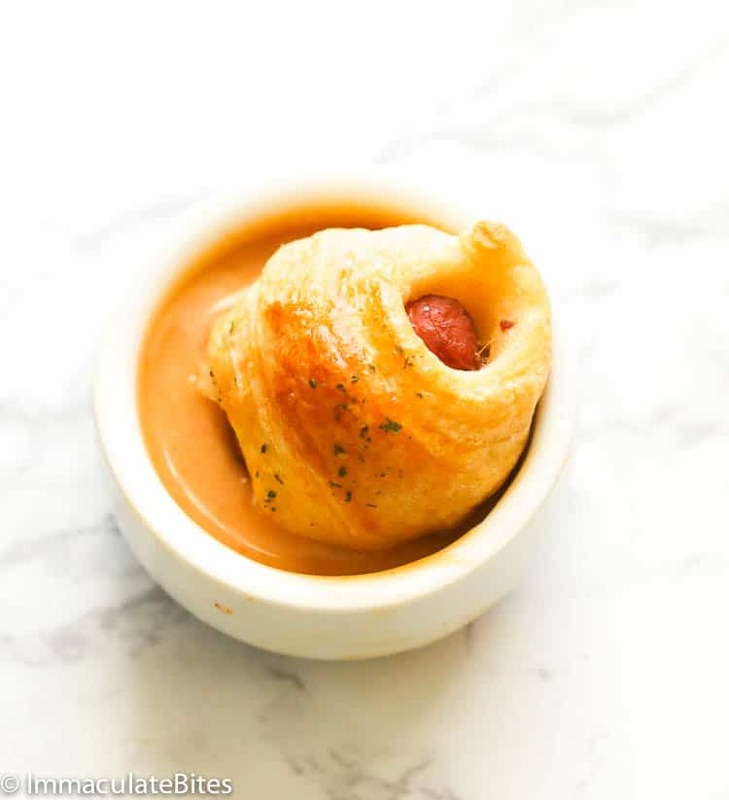 Serve these tasty and appetizing pigs in a blanket with ketchup or this homemade mustard sauce with a kiss of lemon and a spicy kick from sriracha. If you don’t have any Dijon mustard, yellow or stone-ground mustard works fine. Store honey mustard sauce in a covered container in the fridge for up to a week. 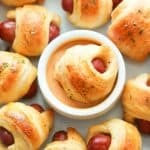 Pigs in a Blanket - crowd-pleasing bite-sized treats made of sausage rolls rolled in a crescent roll dough and baked to perfection. Makes a fun-tastic party appetizer or game day food. Serve it with my homemade honey mustard sauce! In a small bowl mix together mayonnaise , honey, Dijon mustard , lemon juice and sriracha . Thoroughly mix and set aside. Preheat the oven to 400ºF. Prepare baking or cookie sheet by lining with parchment paper. Set aside. On a lightly floured surface, roll out crescent can of the dough (homemade crescent dough HERE); Using a knife separate into 16 triangles. Cut each triangle lengthwise into 3 narrow triangles. Place a cocktail sausage at one end of the dough triangle and roll towards the other end to wrap securely. Place seam-side down on prepared baking sheet. Repeat process until dough is used up . Lightly brush pigs in the blanket with egg wash. If desired, sprinkle top with creole seasoning. Place in the oven and bake according to crescent roll directions or until golden brown. Let it cool slightly and serve with honey mustard sauce. Preheat the oven to 400ºF. Prepare baking or cookie sheet by lining with parchment paper. Set aside. 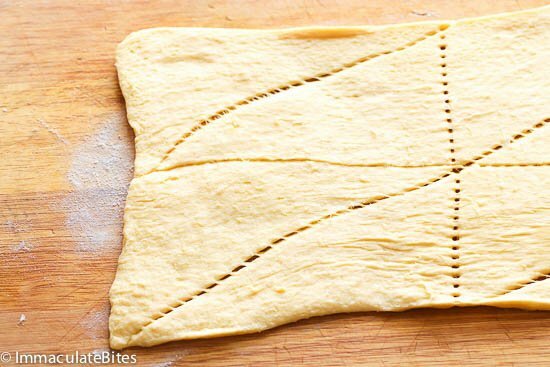 On a lightly floured surface, roll out crescent can of the dough (homemade crescent dough HERE); Using a knife separate into 16 triangles. Cut each triangle lengthwise into 3 narrow triangles. Place a cocktail sausage at one end of the dough triangle and roll towards the other end to wrap securely. Place seam-side down on prepared baking sheet. Repeat process until dough is used up . 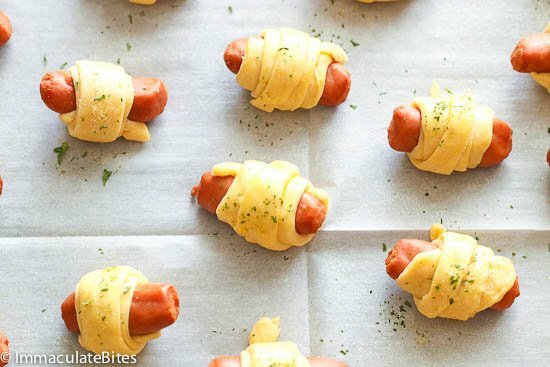 Lightly brush pigs in a blanket with egg wash. If desired, sprinkle top with creole seasoning. Place in the oven and bake according to crescent roll directions or until golden brown about 10 minutes. Let it cool slightly and serve with honey mustard sauce. I’m glad it all turned out great for you. And thank you for taking the time to let me know. Happy weekend! Thanks Mabel, Any hot sauce would do. Adjust to taste. Leave out the mustard .